Atlus has announced that rhythm spin-offs Persona 3: Dancing in Moonlight and Persona 5: Dancing in Starlight will be released on December 4, 2018, in both North America and Europe. 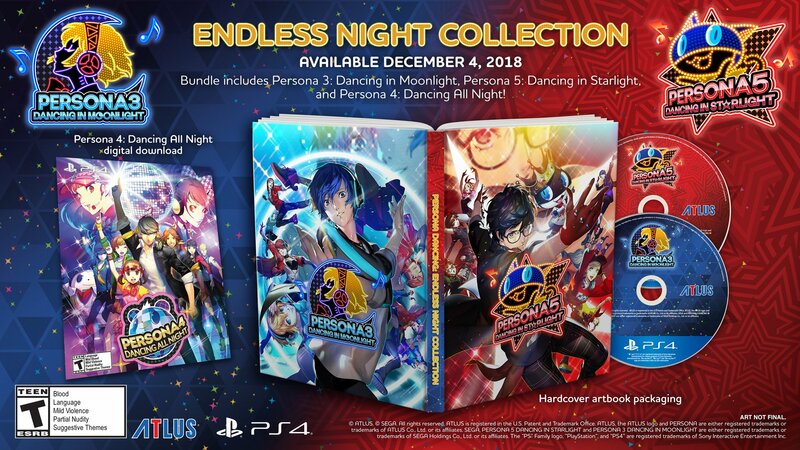 The two games will be available for PlayStation 4 and PlayStation Vita both separately and in a bundle that also includes a free copy Persona 4: Dancing All Night (the PlayStation 4 version will include a PlayStation 4 copy of Persona 4: Dancing All Night). All of the releases will be available digitally-only on PlayStation Vita and digitally and physically on PlayStation 4, though Persona 4: Dancing All Night will only be digital on both editions, with the physical edition including hardcover art book packaging. The individual games are priced at $59.99 each on PlayStation 4 and $39.99 each on PlayStation Vita, with the bundle priced at $99.99 on PlayStation 4 and $69.99 on PlayStation Vita. Dancing in Moonlight and Dancing in Starlight see the Specialized Extracurricular Execution Squad (SEES) and the Phantom Thieves respectively whisked off to Club Velvet, where they are met by the residents of the Velvet Room and forced to perform at a mysterious dance party. Each game features 25 unlockable tracks, including all new remixes from various artists, plus various costumes as well as social scenes and events between characters. The western release will feature both English and Japanese voice overs. As someone who was down for P4, this are just too expensive for what they are. Are there even fifty songs between the two of them? I love the music of both games but I may sit this out until a pretty steep discount. I imported the double pack vita version of the games and they both have exactly 25 songs each once you unlock everything. There are more songs available for DLC, of course, but both games felt pretty bare bones and I wouldn’t recommend it unless you are a diehard Persona Dancing fan. Fighting games and music games I almost don’t even want to purchase these days because you know somewhere along the line you have to keep paying.